Using these energy-saving tips can help you save money and be kind to the environment in the New Year. Of course, the ideal approach is to invest in an entire suite of brand-new Energy Star®-rated appliances, which would certainly boost your home’s efficiency. As nice as that might be, however, replacing every appliance in the house is probably not practical for most of us. So, for a more realistic approach to cutting back on power consumption in 2016, check out our handy guide for ideas on how to save energy with your current home appliances. According to the U.S. Department of Energy, water heating consumes roughly 90 percent of the energy necessary to operate your clothes washer. One of the best energy-saving tips for the washing machine is to use a cold water wash cycle whenever possible. Try to run full loads too, because the electrical cost of washing a large load is the same as for washing a small or partial load. As for the dryer, using it less will provide the biggest benefit. Not everyone has room for a clothesline outside or an indoor drying rack, however, so what’s the next best approach? Make a resolution to clean the lint filters after each and every load, and to clean the dryer ducts on a regular basis to improve air circulation and to speed drying. And, as with the washer, be sure to run full loads. Sensor drying or using low heat settings will use less energy too. Your refrigerator and freezer are big energy hogs, but you can take steps to significantly increase their efficiency. First of all, be sure to keep the thermostat at the proper temperature — between 37 and 40 degrees for the refrigerator and 0 to 5 degrees for the freezer. Clean the condenser coils and remove dust and debris periodically. Dirty coils will force your appliance to work harder and longer, and use more energy. Minimize the time the door is open, especially in the summer, to avoid making the unit work harder to maintain temperature. Finally, switch off the ice maker, as it consumes a lot of energy. For your range, you can save energy by managing how you use the appliance. When operating the burners on an electric stove, have you noticed that they can remain hot for a few minutes after being switched off? Take advantage of this residual heat by cutting the power to your burners a few minutes before the end of your cook time. Do the same with your oven. And be sure to match the size of your pan to the size of your burner — using a small pan on large burner squanders energy. Check your oven door seal periodically and have it replaced ASAP if you notice any damage or cracking. Also, if you feel heat escaping around the oven, have a technician take a look. Not only can this result in excess energy use, but it can negatively affect the quality of cooking and baking. Dishwashers are a lot like washing machines in that most of their energy use goes to heating water. However, hot water is a necessary to ensure proper cleaning and sanitation, so you’ll need to try other solutions to cut costs. Make sure always to run full loads, as any load will use the same amount of electricity. Switch to the no-heat option for the drying cycle and run the shortest load necessary to clean your dishes. 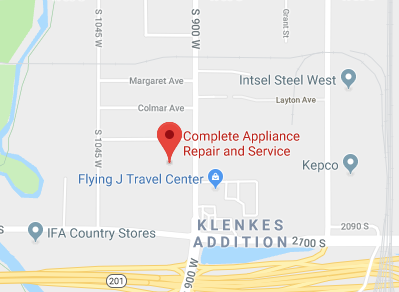 At Complete Appliance Repair, we know that the best way to keep energy costs down is to keep your appliances in good working order. This year, have one of our experienced technicians inspect your home appliances. Preventive maintenance will not only save energy, it will help prevent unexpected and costly repair bills by catching any potential problems before they escalate. Be sure to ask the technician for more energy-saving tips for your appliances! This entry was posted in Blog and tagged Energy saving tips, home energy saving tips on December 18, 2015 by admin.